For every illness there is a perfect cure. Not really. But it’s what the Quacks would have you believe. For as long as anyone can remember, the quacksalvers have been trying to hawk their wares. It’s a Dutch term from around 1570 according to Wiktionary, quacksalver. It means ‘hawker of salve’. When you’re really poorly you want to believe that there is something which will put it right, once and for all. And if you’re the sort who has money to spend on quacksalve, you might very well do so, in a desperate attempt to make yourself well. There is evidence that ‘letters patent’ were issued by royalty to those peddling remedies. according them respectability by association. History records Andersen’s Pills,which were first made in England in the 1630s, allegedly pilfered from Venice by a Scotsman who claimed to be King Charles I’s physician. In 1614 a Leicestershire clergyman, Thomas Daffy, invented Daffy’s Elixir: an elixir of life. And it used the newspapers of the day to advertise, and guaranteed itself longevity indeed: for Daffy’s elixir was used to treat anything from kidney stones to convulsion and indeed consumption. How did it endure, when it clearly did absolutely no good whatsoever? I’ll tell you how: marketing. Pamphlets spread the preposterous claims far and wide, as did advertising in newspapers as they began to emerge. If it’s written down in the paper, it must surely be true. With a new century came a new breed of quack. Thomas Holloway’s parents were bakers in Devonport, and later moved to Penzance in Cornwall to manage the local pub, the Turks Head. As for Thomas, he went to France for a while, and dabbled in import/export, as you do. And that brought him into contact with an Italian who made his money-making a general purpose ointment. Two can play at that game, Thomas thought, and he set up a lab in his mum’s kitchen and began making potions. And once he had ointment and pills, he started spending huge amounts of money on advertising: some £5,000 in five years, a king’s ransom at that time. He grew rich beyond the dreams of avarice. But he was a paternalistic quack. His vast wealth must be spent, he resolved, on a gift to the nation. Actually, two gifts. He enlisted the services of architect William Henry Crossland to create a women only college, dubbed Royal Holloway, and hung on its walls masterpieces of international importance. 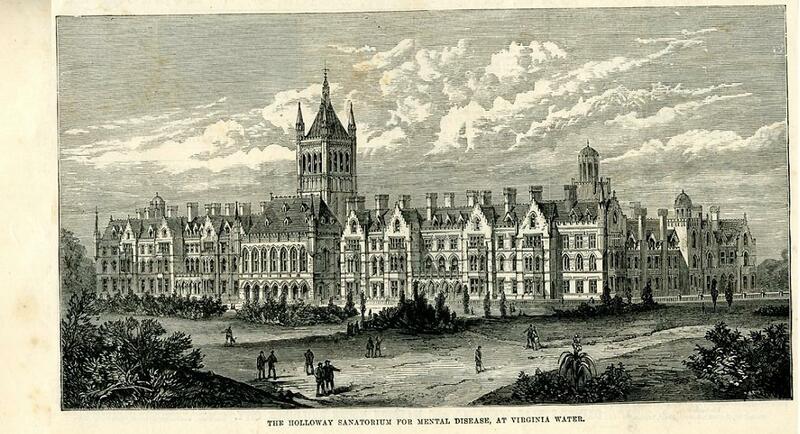 And nearby, he had a hospital built by Crossland: Holloway Sanatorium. Its patients were not just anyone, you understand. The poor had many asylums built already and funded by charities. The rich could afford care; but the middle classes could not. Thus, the hospital was built for “the professional breadwinner whose income ceases when he is unable to work”. And so it was built on Holloway’s own land, high on the hill at St Anne’s Heath, Virginia Water. It was to be visible from another of the century’s miracles, the railway and Virginia Water Station. It was a very beautiful building, funded by one of the greatest, and indeed, richest quacks the British Isles has ever known. Who would have predicted that a humble tincture could spawn such a wonder? And all using the power of advertising. It amazes me how gullible we people are. We have a problem, someone offers an instant solution, we fall for it. Yes, you spotted it: I’ve been ruminating on passages in mental hospitals and for a Victorian one, this is rather beautiful inside. Even more now, that the whole place has been turned into a gated settlement for millionaires. You are so right. This quack became one of the richest men in Britain, off the back of the gullibility of the British people. How interesting that it has become a different type of ‘safe place’. I wonder if being wealthy is a different type of madness, after all once you have enough to live on for the next 100 years, what makes people chase “wealth” on and on? Pleasure, Madhu. I am now waiting until English Heritage arrange a tour. Should be interesting…. A Utopian dream full of longing, Tilly. That shows we are still on to it!. Even as on date, we believe what the media spins. Pleasure 🙂 Yes, we’re still falling for advertising and media hype. critical thinking does not come easily to many, it seems. “Pamphlets spread the preposterous claims far and wide” – and don’t they just continue to do so to this day – there are whole TV channels dedicated to this garbage, playing to people’s desperations. At least Thomas gave back to a society he had conned. indeed. Look at the shopping channels, a litany of useless gadgets one has not even dreamt exist. Subduing, really. I agree, Kate – the machine of consumerism is a depressing fact. All the world’s a market waiting to blossom.
. . . and still, lo these years later, we are still being taken in by preposterous marketing schemes. Some food for thought here, Kate, and another corridor. Absolutely, Penny. The corridors here, I suspect, might be rather nice. Pictures of the inside are incredible, if a bit Victorian and over-the-top. I shall find out the next time its custodians, English Heritage, negotiate with its owners – Octagon Developments – to open it up and offer tours. The thing about quackery is, that if enough people believe and there is an improved sense of well being then the medicine can be said to work. How nice that the gentleman in question indeed used his wealth to benefit others. Hmm I wonder if ethically that frees him from the initial quackery crime? I understand that when Coca Cola first came out it was sold as a remedy rather than just good old pop. Was it? Good gracious! Nice to have an angle on quackery from a nurse – I had never thought that even a quack remedy might do some good! The original coke had cocaine in it, as a “remedy”. I’m fascinated! Imagine ill-gotten gain (perhaps more literal than I intend) being used philanthropically. What a relief that this kind of nonsense wouldn’t possibly pass today. One of my favored sayings is “we don’t all spell integrity from the same dictionary.” This was a rich story, Kate! I love the saying, Debra. So true! Ah! these instant solutions and our habit of falling for them. I know, Jas. Will we ever learn? I would love to spend a night there, Cameron; as it is, I am on the lookout for the first tour English Heritage are willing to provide! I wonder if he cured anyone through the “placebo effect”? They BELIEVED it would help so their bodies manufactured the cure needed? Wonderful post about quackery, Kate. Another one of these……..Coca-Cola was originally a quack medicine. Kate, quacksalver sounds much more genteel than what we’d call Holloway on this side of the pond: snake oil salesman. It also sounds like it could be the name of a new band or a band of Monty Python wannabe’s. Quacksalver. I like that. Just think if Mr. Holloway had been able to advertise on TV! He would be the owner of a multi-national corporation. I think a number of our American politicians should be called quacksalvers. They are certainly peddling quacksalve to the masses. Love it! Thank you for the amusement today! Some things never change, Kate. Now we have internet ads that promote: “Doctors fear me,” “a cream that will make your wrinkles disappear,” and many others. Nice to know, though, that he did do some good with his earnings.